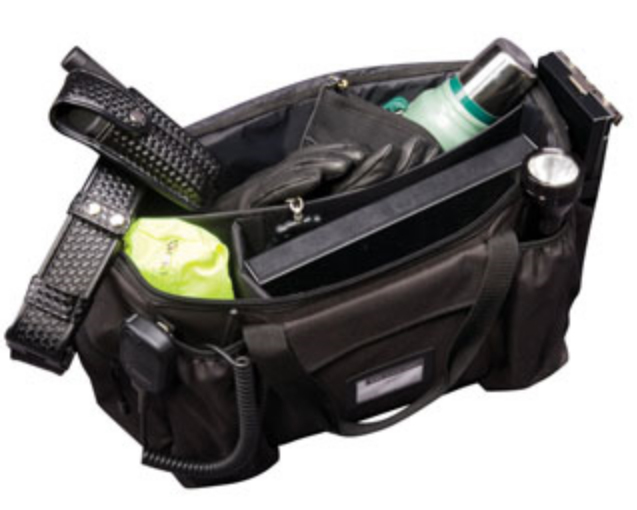 Whether you are looking for a patrol bag to sit on the seat next to you during a standard duty shift or you want a versatile gear bag for storage in the trunk of your car, you can't go wrong with the Patrol Ready Bag. Designed with the patrol officer in mind, this bag is designed to organize your duty gear and make it immediately available whenever you need it. The large main compartment has an adjustable panel to break up the space. The interior of the lid has two zippered pockets along with a variety of organizational pockets for pens and paper related accessories. The outside of the bag has two large water bottle pockets, two end zippered pockets and a flat pocket with hook and loop closure flap for thinner gear. There is loop Velcro on the top of the bag so you can add loop to your citation box and have it sit on the top of the bag when you are driving. The Patrol Ready bag has durable nylon carrying handles with a Velcro closure and a heavy-duty shoulder strap with removable clips and D rings. Finally, there's a transparent ID/business card window so you can identify your bag from your partner's. Made of 600-denier polyester, this bag will endure long hard days on patrol and look good for years. The quality and versatility of the Patrol Ready bag make this piece of equipment an exceptional value. The Tactical Patrol Ready Bag is another top-notch piece of gear from 5.11 Tactical.